Walking through a time portal wasn’t too challenging for the students of PYP 3, because their recent field trips took them on a journey through time, offering them glimpses of past civilizations, the lives of our ancestors and the artefacts that stood strong through the sands of time. 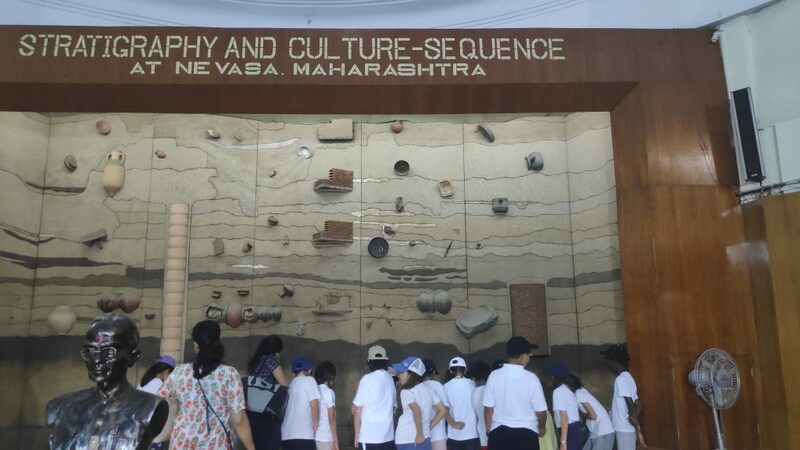 To inquire into the unit ‘Where we are in place and time’, the students of PYP 3 visited two places – ‘Raja Dinkar Kelkar Museum’ and ‘Deccan College – Department of Archaeology’. These two field visits proved instrumental in building the existing knowledge the learners have about life in the past. Nestled in the heart of Pune city, the museum showcases a wide variety of artefacts, art forms and handicrafts from each and every part of India. Collected by Dr. Kelkar, each artefact on display offers a glimpse of the culture and ethnicities of India, shedding light on the past. On entering the museum, the children were overwhelmed by the simplistic beauty of the place, and the collections on display. Carefully curated and classified under broad categories, the artefacts represent the domestic and regal life Indians led in the past. It offers a peek into the rustic household materials, painstakingly crafted sculptures and murals, arms and armour, handicrafts, textiles, and musical instruments used over time. Their keen interest in the art and detailing of the artefacts showed their awe and appreciation for the life of the people in times gone by. Replicating the essence of a feature film, the highlight of this visit came towards the end of the trip, where the students were able to see the room of Mastani, a brave Queen of the Maratha era. Dismantled from its original historical location (Shaniwar Wada), it has been carefully reconstructed in this museum. All the students were amazed with the intricate details on the walls, windows, tapestries, and furniture of her personalized quarters. The artefacts housed in the museum were a great way to introduce the learners to compare and comprehend how our present times are completely different from the life in the past, however, it also shed light on how we follow a lot of practices which are inspired and derived from the past. A journey to other end of the city didn’t go in vain, as an excellent learning experience was awaiting PYP 3! Deccan College – Department of Archaeology, is a quiet, stone building, and very few know about the rare archaeological evidences and artefacts that have been curated and put on display here. Learners were welcomed by Ms Aparna Joshi, who briefly informed the class about stratigraphy – how evidences from the past lay buried on different layers below the surface of the earth. The procedure used for retrieving the artefacts was discussed and learners were offered a chance to comprehend how archaeology informs us about life in the past. Sections of the museum were arranged according to the timeline the artefacts belonged to. This gave the class a feeling that they were progressing from prehistoric times to more recent ages, such as the Iron age. Specimens of tools and equipments used since the stone age facilitated the learners to visualise how human creativity and intelligence has evolved. The class made connections between the ideologies observed back then and still existent in present times. 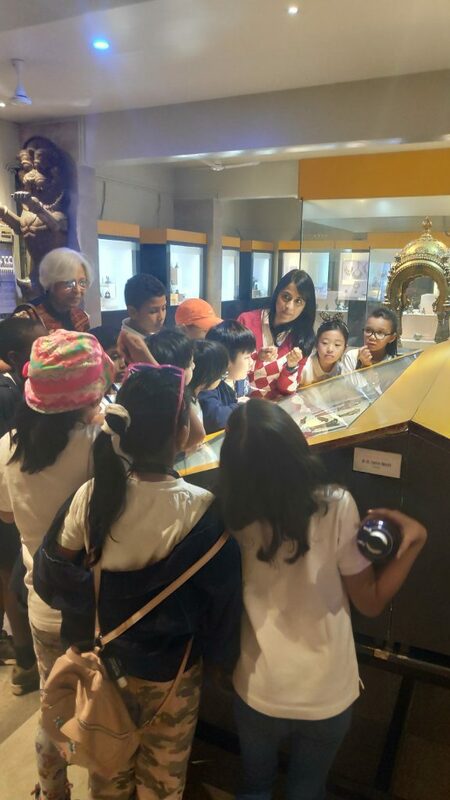 Not only did the children learn about the past, but they also realized that preserving, documenting, and caring for the aspects of a particular time period would provide footprints for future generations, helping to create a better human civilization. This virtual journey into the past surely facilitated each student’s exploration into ancient civilizations, and will help them unravel the essence of the past!